New York—A first edition of one of the most influential books in Western medicine, De humani corporis fabrica (On the fabric of the human body) by the Flemish physician Andreas Vesalius, is the highlight of Bonhams sale of the Medical and Scientific Library of W. Bruce Fye in New York on Monday, March 11. It is estimated at $300,000-500,000. Vesalius (1514-1564) was only 28, and a Professor at Padua University, when he published De humani corporis fabrica. 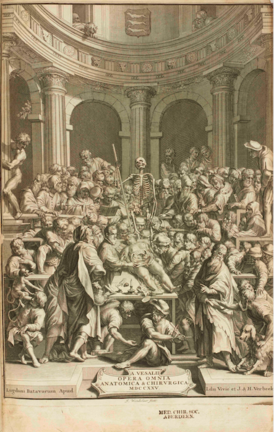 It transformed the science of anatomy and the way it was taught, by applying the critical methods used by humanists. The book was published in Basel in 1543, with more than 600 pages of text and beautifully detailed engravings by artists from the workshop of Titian. It was originally owned by Vesalius’s great friend, the German physician Achilles Gasser. The sale of the Medical and Scientific Library of W. Bruce Fye comprises about 400 lots divided into four sections: Classics of Medicine; Johns Hopkins and the First Faculty; Early Medical Photography and Books and Manuscripts by important cardiologists. A further 400 lots will be sold in an online sale starting on March 12.